Now that Cattails [Steam, Official Site], the animal simulation RPG is out in the wild I've managed to take a look, here's some thoughts. In case you're wondering, I'm still completely terrible at hunting. I've seen people compare it with Stardew Valley and I can see why a little in terms of style and pacing, but it's a very different game that stands firmly on its own four paws. It's actually quite light in terms of content and things to actually do, surprisingly so in fact. The vast majority of my time has so far been wandering around, hunting small animals and foraging. For those wondering, you are able to have your own little family. Although there's only nine cats that are actually possible to do this with, with a lot of them having very limited abilities and conversation on offer. It will take quite a while for you to get a family, with you needing to woo another cat and upgrade your den first. There's caves to find spread across the world, which have friendly moles in who will trade gems in return for cash and items. Weirdly, in a game about hunting animals, if you kill a bat in the caves, you cannot eat it. Every other animal I've come across can be hunted for food, except for bats. It's a bit of a balancing problem, since digging in the caves rapdily drains your hunger, requiring you to stock up before you go digging. Considering hunting isn't exactly easy, It felt quite unfair to not be able to eat the bats. The random (I assume) generation for caves is a little off too, with small sections often being completely innaccessible and they have some rocks you break in them. Considering how hard it is to find the gems, if any of those have the gems that's a problem. The map and politics system is quite interesting, with the map cut into sections and each section can be controlled by a colony. Battles between them will occur along the borders, which can get a little hectic and rather amusing. You can also increase your influence in parts of the map using Lavender that you forage, so it's worthwhile picking it up whenever you spot it. One part of the map system did bug me though, which is how it's completely reloaded between the sections. That's not so bad by itself and quite common in smaller games, but when you're trying to catch your prey, having them just run off the map and vanish is quite annoying. I've lost count of the amount of times I've hunted down the elusive squirrel, to have them just walk off the map while I'm trying to get into position. 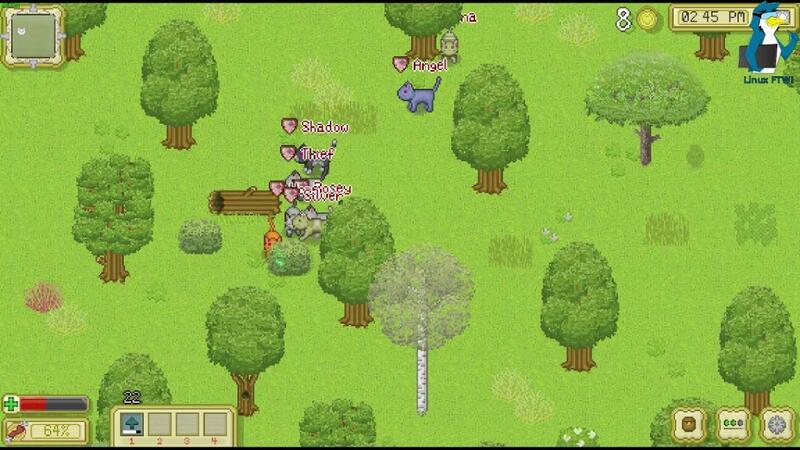 The hunting and combat system is also quite difficult to get to grips with. When you attack, your character instantly stops, so if you're not able to land close enough when you pounce during hunting, it can be very frustrating as your prey can (as noted above) just run off the map to freedom. Rather satisfying when you manage to get some good grub though, as even a single catch can keep you going for quite a while. It's also possible to upgrade various abilities, like Hunting, to make it easier over time. It's honestly amazing how much easier it is once you've put some XP into the skills, so don't be put off by the initial difficulty. You also unlock more special skills with the XP system, so the game does open up more as you progress. They did reach a stretch goal on the original Kickstarter to enable you to create your own colony, which is not in the released build of the game. They said this is planned for next year, so hopefully they have more coming too. It does need more content, if it's going to keep player interest for long. It might seem like I'm being a little on the negative side about this one, but I do like it. Overall, it's cute and relaxing and I do think it's worth checking out if you're a fan of the slower-paced style. The Linux version also works without any issues, so that's great to see for a new release from a new developer. "The vast majority of my time has so far been wondering around, hunting small animals and foraging." So just like a real cat. Mountain Man "The vast majority of my time has so far been wondering around, hunting small animals and foraging."